CoLab Radio » Blog Archive » What’s Happening at the Oldest Buildings in Your Town? What’s Happening at the Oldest Buildings in Your Town? 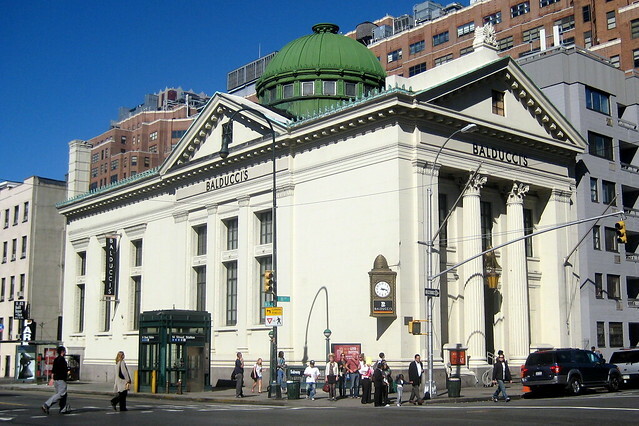 The New York Savings Bank Building in Chelsea, built in 1897, now houses Balducci’s, an upscale grocery store. Photo by: Wally Gobetz. We are planning a series of posts profiling old buildings that have become new again. Anyone is welcome to contribute a post highlighting a building from his or her city, anywhere in the world. Next month, former CoLab Radio Executive Editor Alexa Mills will present the collection of posts on a panel in Greece about the reuse of old historic buildings. Identify a historical building in your town or city that is now being reused for a different purpose. Buildings can range, from old jails and houses of worship to factories and schools. And, depending on the history of your town, “old” could mean a castle built in the late 1400s or a school building from the 1950s. The more diverse the contributions, the better the series! Try to find a building that strikes you as unique, and someone else will likely be intrigued too. Take one photo of the building from the outside and 2 photos of details that show traces of the building’s past use. Traces of past uses will vary; they could be found in architectural details or current programming decisions. In a Moscow modern art center, housed in what used to be a wine factory, a small workshop for wine tastings hints at a past life. Or, in a former mechanics garage now operating as a café, clues of a past life are visible in openings on the building’s facade that frame the space once filled by roll-up garage doors. If you have access to an old archival photo of the building and would like to include that, please do. Make sure to note the source. An important goal of this series is to reflect geographic diversity. Consider sharing an example from your city and invite a friend from another city to do so as well. When you’ve completed your post, email it to Nse Esema at colabradio@mit.edu. Please send in your post by February 20th.